noun | e·lix·ir | (i-LIK-ser): a magical liquid or potion that can cure illness or extend life. 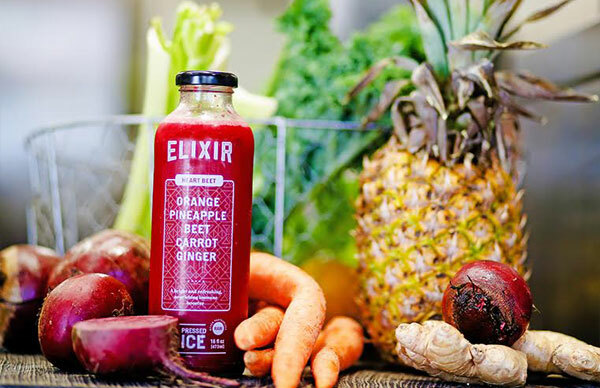 The Elixir Juice & Food revolution, located in the “Heart” of Healthy Living” Del Mar, California, makes every effort to be as local and organic as possible, and offers exceptional service in an inviting, warm environment for all. Dedicated to providing delicious, healthful, conscious cuisine; Elixir was created for all people. Elixir adds a new food dimension to the bustling village center on the corner of 15th and Camino Del Mar. It is created by Chef & Del Mar Resident, Randy Gruber, established “food-preneur” and chef/owner of the hugely popular Americana Cafe, known to thousands of visitors and residents of Del Mar since 2000. Vibrant, Colorful, Natural, Local & Knowledgable is what Randy and his exceptional team at Elixir serve up well thought out recipes, quickly and conveniently for your busy life. Come enjoy organic juice and food made with love in the heart of healthy Del Mar.